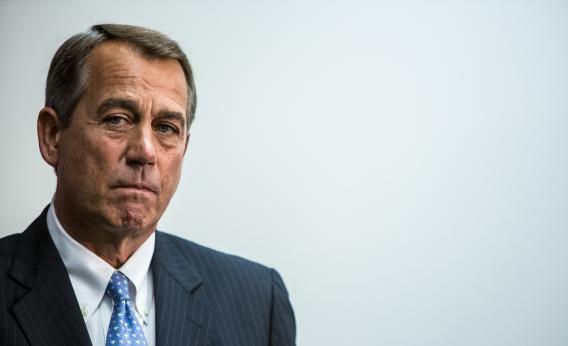 John Boehner supports White House position on drone strikes. House Speaker John Boehner (R-OH) listens during a news conference in the U.S. Capitol on February 5, 2013 in Washington, DC. Here’s one reason why drone warfare and targeted killing don’t really get discussed in Washington unless there’s a memo leak or a protest: There’s bipartisan consensus to whistle awkwardly and let the system continue. At John Boehner’s weekly press conference, PRI’s Todd Zwillich asked whether the most powerful Republican in the country, a “constitutional officer,” had any concerns about targeted killing. After all, Congress could hold hearings. Congress could cut funding. When an individual has joined al-Qaida — the organization responsible for the murder of thousands of Americans — and actively plots future attacks against U.S. citizens, soldiers, and interests around the world, the U.S. government has both the authority and the obligation to defend the country against that threat. In general, Republicans agreed with the legal theories behind all this when George W. Bush was president. They agree with the theories now. They might call for more transparency, as Sen. John Cornyn is doing, but they don’t do so because they question the basis for the attacks.